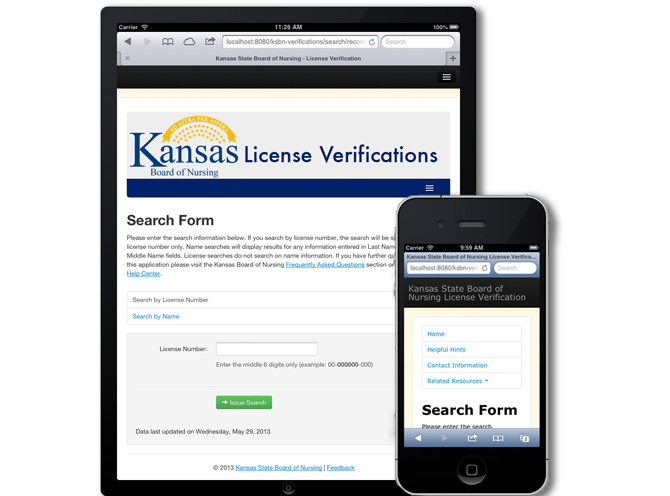 The Kansas Board of Nursing License Verification system provides for quick online nursing license verifications of active licensees. To use this system, you will need to know the name or the license number of the person for whom you are searching. NEW! The KSBN License Verifications app is now mobile! Hospitals, educational institutions, nursing homes, staffing agencies, and others rely on the Kansas State Board of Nursing (KSBN) for verification of employees' nursing license status. Previously the only option was verification on a license-by-license basis. But now, KSBN has a New Automated Verification Service. The KSBN Kansas Automated Nurse Notification (KANN) system allows employers and educational institutions to be proactive on license verification. Subscribers to the system will be notified when the status of a license changes, including renewals. The notification system has three tier pricing options. For more information on KANN, please visit the KSBN.org Web site or contact KSBN at 785-296-4929.